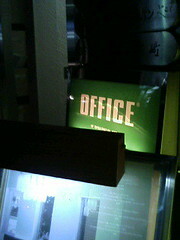 Right now I’m at a place in Gaienmae called “Office”. If you’re in Tokyo and looking for an interesting place to while away a couple of hours alone or with friend(s), you can’t go wrong stopping by here. It has a bit of the feel of a college coffee house, except that instead of having a view out to some “quad” or whatever, it has a 5th floor view out to a neon-lit busy Tokyo intersection. Other particulars: a full drink menu, including liquor, sake and shouchu, beer, wine, juice, tea, and coffee. Nice lighting, nice staff, usually good music. Seating for about 30 people and not usually crowded (so a good choice for impromptu gatherings). A selection of decent light food. And reasonable prices. A variety of interesting books and magazines you can borrow and enjoy along with your food and drink. Also, a real rarity in Tokyo: outlets into which you are free to plug in your laptop’s AC adaptor and/or keitai charger. And to top it all off: it’s open until 3am every night, including Sunday and Monday. To find it, just ride the Ginza line to Gaienmae station, take exit 3, and you’re there. Well, almost. What you’ll see at the street level when you come up and out from the exit is a place called “Sign”. Office is in the same building, just on the 5th floor. So just go around the corner, left from the entrance to Sign, and climb the stairs (no elevator) up to Office, and enjoy. Somebody needs to start a list of these kinda places in Tokyo (latenight replacements for Denny’s), it seems like there are so few.